Pipa (Chinese lute) 琵琶 resembles the Spanish guitar in some ways. It has a pear-shaped wooden body and has a history of over 2,000 years. The most common pipa has a body with a short neck and a wooden belly. There are 4 strings and 19 to 26 bamboo frets on the neck. The frets are either made of wood, jade, or elephant tusks. The player holds the pipa vertically in the lap and plays it using imitation fingers. This allows more freedom for the player to perform various techniques on the four strings. 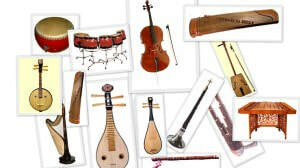 The range of techniques that can be used are the widest among all of the Chinese plucked-strings, making it the most expressive instrument in the plucked-string section. Some of the techniques include: fretted pitch-bends, tremolos, various double and triple, and a continuous strumming of the strings with four fingers.